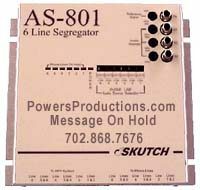 Skutch AS-801 The AS801 Line Segregator (sometimes called a Line Separator) lets different companies have their own Music/Message On Hold on one Telephone System! The once impossible task of providing different Music/Message On Hold messages to specific, user defined, groups of telephone lines, in a single KSU, is now easily accomplished with the AS-801 Music/Message On Hold Segregator unit. One typical application might be a legal office with multiple attornies each having their own Message On Hold. Another application could be at an automobile dealership where the Sales Department has (example) 3 lines with a Sales related Message On Hold, while the Service Department has 2 lines with Service related Message On Hold information, and the Parts Department has 1 line with a Parts related Message On Hold. You can even use one of your audio sources (three total) to have silence to a caller on that (or those) selected line(s). All of this on a single KSU-Phone System. The AS-801 Music/Message On Hold unit allows you to configure the groups any way you desire, allowing you to have up to 3 different audio sources with up to 6 Separate CO ("Central Office") telephone lines. More than 6 lines or more businesses can easily be handled with multiple AS-801 Units. The AS-801 provides you with "per call, hang up signal passing," along with easy access to all controls on the face of the unit. Note that your key system must already have existing Music-On-Hold capability and all telephone lines must be standard 1NB (Analog) lines. The AS-801 will not work on DID, T1, T2, or ISDN lines. The key system needs to be connected to the phone lines via modular connectors. If your key system is hard wired, you might need to hire a a telephone technician to install the system. The AS-801 installs in series, between the KSU and the CO telephone lines. The unit is connected to the telephone lines via MODULAR connectors. The AS-801 supports both RJ-11 (1 line per jack) and RJ-14 (2 lines per jack) MODULAR connectors. Note that ALL lines that normally go through your PBX/KSU system and are EVER placed on hold MUST first pass through the the AS-801, even if you don't want your On Hold programming on that line. Failing to do so will result in your caller hearing a SOLID TONE on that line (not passing through the AS-801) when put on hold. If there are lines that are never put on hold (a direct telephone hot line or back line, a fax machine, etc), you may use those lines as normal without passing them through the AS-801. If you have lines that should not have On Hold programming, direct those lines (or that line) to an unused music source port. (three music source ports total on each AS-801).